The client approached Halsall and Associates to assist with the appropriate subdivision/development of their significant land holding at Caves Road, Margaret River. The site is situated with extensive frontage to the Margaret River and Caves Road and has excellent scenic qualities. The dilemma was that the site was already utilised extensively for intensive agriculture including prime vineyards and olive groves. Other activities including grazing of Deer and Wiltshire Horn sheep also occurred on the property. The brief was to provide for rural residential subdivision opportunities in areas not utilised or viable for agriculture whilst maintaining the prime agricultural activities in the balance areas. 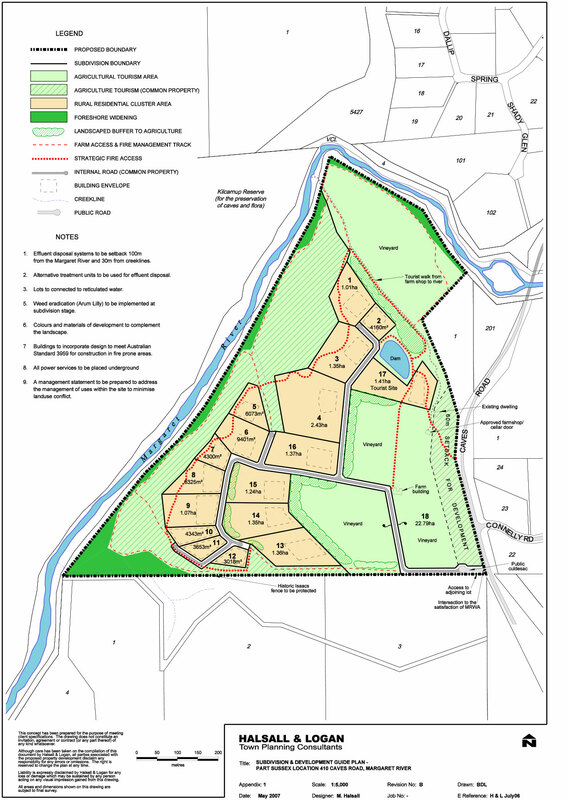 Detailed consideration was given to an opportunity under the Leeuwin Naturaliste Ridge State Planning Policy for a clustered rural residential subdivision using a strata titled format. Initial location of dwelling sites (lots) was determined based on areas less suitable for agriculture and landscape assessment. This was then followed up with detailed fire management assessment, environmental investigations and planning design. This resulted in a 17 llot cluster proposal with balance agricultural lot and common property frontage area to the river. A Scheme Amendment was supported by the Shire of Augusta-Margaret River and gazetted following consideration by the Planning Commission. 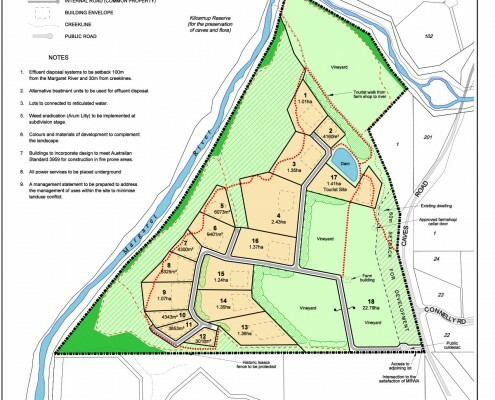 Subdivision approval was issued in 2009 and this development will be a progressive example of the clustered opportunities that are now being promoted as an alternative to typical special rural/rural residential subdivision. The proposal has regard for the landscape qualities, environment and agricultural capabilities of the site and will be a quality private residential estate where all landowners will have part ownership of common property adjacent to the Margaret River. The proposal was difficult in that it was necessary to immerse rural residential dwelling opportunities within a working intensive agricultural farm. The inter-relationship of these uses required the proposal to be carefully formulated. Given the exposure of the site, the selected location of the dwellings was also important to ensure that the site maintained its scenic quality particularly when viewed from Caves Road but also internally such that each dwelling site maintained a high level of amenity. Other important issues that were resolved included inter relationship with the Margaret River and appropriate foreshore considerations, detailed Fire Management Planning given the site is adjacent to nature reserves and demonstrating the appropriateness of development from an environmental prospective.